Like just about every other kid growing up in the late twentieth century, I could never get enough of Star Wars. So it's no surprise that a grown-up Jedi-wannabe with a knack for the culinary arts would turn to Star Wars food carvings for entertainment. There was just one problem... after hours of carving, I wasn't sure I'd be able to destroy my handiwork. After all, who wants to squash a sweet potato that's been lovingly crafted to look like Admiral Akbar? 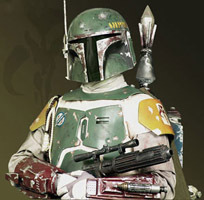 Or demolish a Daikon radish in the form of cult hero Boba Fett? Not me, that's for sure. But what if I could create a Star Wars figure that I wanted to destroy? Surely then I'd be able to slice into it without remorse. Choosing a character did not turn out to be difficult. 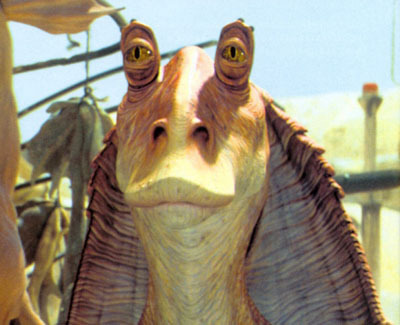 Jar Jar Binks was easily the worst thing about The Phantom Menace. If I could create a scrumptious salad out of him and serve him up with a tasty crostini, perhaps I might have my revenge. 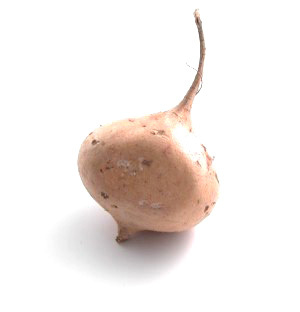 Jicama proved to be just the right medium for my sculpture — it's a tuberous root vegetable that is perfect for food carvings. It's crisp, cuts easily and doesn't dry out quickly. Jicama doesn't taste like much but readily absorbs the juices and flavors of a marinade or sauce. 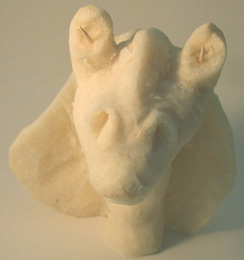 Carving a Gungan out of a jicama is fun, but time-consuming and a little tricky. It's a lot easier if you have a good variety of carving tools at your disposal. 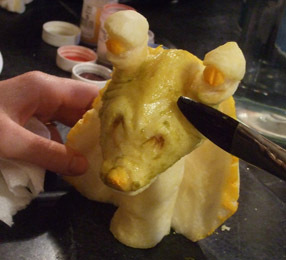 You won't be surprised to hear that professional food carvers use all sorts of fancy gadgets for their food carvings. But you don't need upscale tools for this project. You'll need a sharp knife with a mid-sized blade for removing large chunks of the jicama and at least one smaller blade for detail work. In the accompanying picture, you can see my choice of tools: a Kershaw Ken Onion Leek and an old Swiss Army knife. I also used a Forschner 3-inch Paring Knife. That's shown in one of the pictures below. 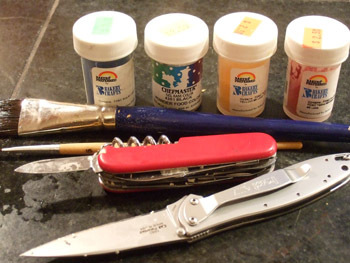 You'll also need toothpicks, a mid-sized paintbrush and a fine-point brush for coloring Jar Jar. Any kind of food coloring will do, but I chose Chefmaster powdered food color because that's what I had in the house. 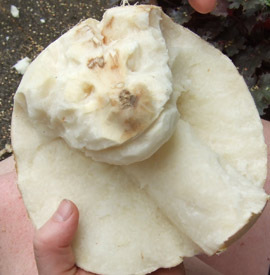 1 large jicama. Though you might want to get an extra as a backup! Find some good pictures to use as a reference while you work. You'll need more than one, preferably from different angles, since you'll be creating JJ in 3D. Start by fleshing out the basic shape. 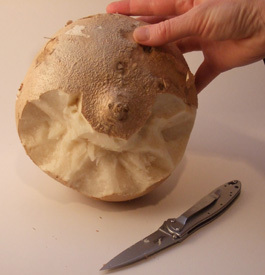 Carve away large chunks of the jicama using your mid-sized blade. It shouldn't take long before you've got the major features in place. Now for the detail work. A few key intricacies give Jar Jar his telltale look: his wrinkles, his eyes, and his goofy smile. The wrinkles are created by making small notches all around his nose and ears. Eyes are just round jicama balls that are attached via toothpicks after coloring is done. Eyelids are separate as well and just sit on top of the eyeballs. Last up is the food coloring. Paint the majority of his body greenish-brown. Jar Jar has a mottled look, so it's okay if you don't get this part perfect. There's a lot of chopping to be done in making this salad. But hey, this is a cooking site. Around here, we look for excuses to chop! Julienne the carrots, onion, peppers and tomato. Don't know how to julienne? No problem -- just cut up the veggies into oversized matchsticks. Combine in a large bowl. Squeeze the limes into a separate, small bowl and whisk in the vinegar, honey, olive oil and cayenne pepper. Salt and pepper to taste. Pour the lime mixture over the chopped veggies, add the chopped cilantro and toss. Carefully place Jar Jar in the middle, then let sit for 30 minutes. How to present Jar Jar is really up to you. If you and your guests are anything like me, you'll be chomping at the chance to sit down at the dinner table and slice Jar Jar to bits. I suggest putting some sharp knives around the edge of the bowl. Let your guests slowly dismember JJ and enjoy munching his eyes, ears and ridiculous smile. 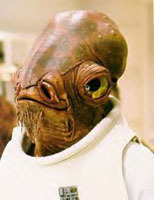 If, on the other hand, you liked Jar Jar in Star Wars, you might want to preserve him a bit longer. In that case, carve up a second jicama and add that to the salad instead. Let Jar Jar be a garnish and keep him intact until the party's winding down. Above you'll see the final product -- a single serving of Jar Jar Binks Jicama Salad. 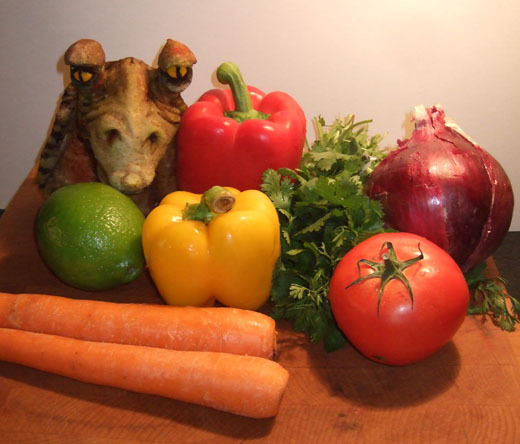 Mr. Binks may look gross, but he gets tastier and tastier as his insides absorb the lime-vinegar juice. 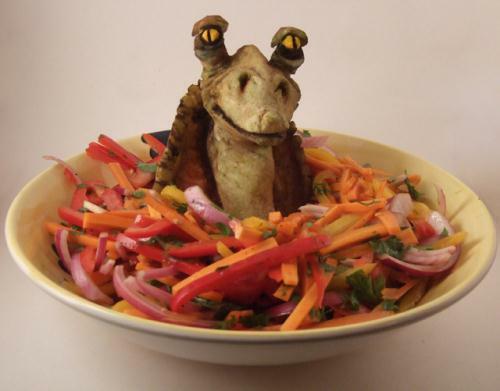 Mmmmm... Mesa happy to eat da Jar Jar salad! 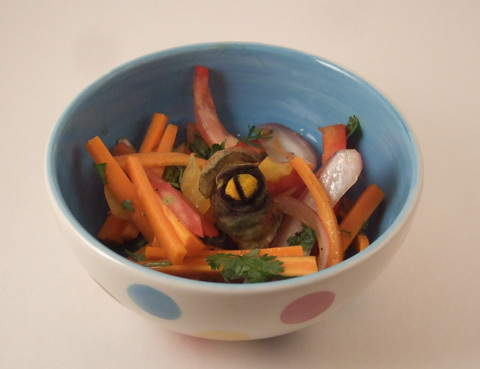 I had a lot of fun creating this salad, but food carving is actually a serious business. Want to see some amazing food sculptures and get an inside look at what it's all about? 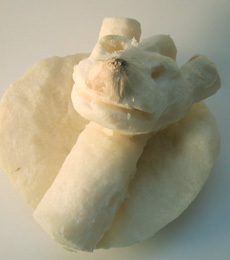 Check out this recent New York Times article on food carving. 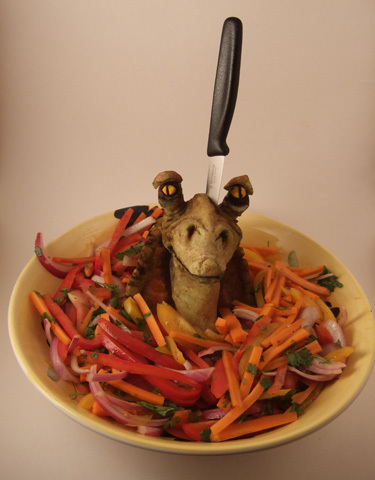 If you do decide to make a Jar Jar Jicama Salad, drop me a line and let me know how it went. Or, better yet, invite me over and I'll help you slice him up! I’m shocked. Shocked, stunned, and surprisingly jealous. Got any more photos of your carvings? LOL, good one dude I really like those carvings. very nice. Whoever makes it, he/she must have lots of free time. Wow! Now can you make a Yoda out of a carrot? LOL! This is both hilarious and awesome! Very cool tutorial! I wish I could make that! But seriously, remarkable resemblance. I hope you sliced him up with appropriate vigor and maniacal laughter. the only acceptable jar jar is one that can be eaten and never heard from again!